[av_section min_height=’25’ min_height_px=’400′ padding=’default’ shadow=’no-shadow’ bottom_border=’no-border-styling’ id=” color=’main_color’ custom_bg=” src=’https://www.innovationgeneration.com.au/wordpress/wp-content/uploads/2015/12/WEB-BANNER-2016-C.jpg’ attachment=’782′ attachment_size=’full’ attach=’scroll’ position=’bottom center’ repeat=’stretch’ video=” video_ratio=’16:9′] [av_two_third first] [av_image src=’https://www.innovationgeneration.com.au/wordpress/wp-content/uploads/2015/12/INN-GEN-LOGO_Conf2018_Wagga_white-NEW-1030×174.png’ attachment=’1775′ attachment_size=’large’ align=’left’ styling=” hover=” link=” target=” caption=” font_size=” appearance=” overlay_opacity=’0.4′ overlay_color=’#000000′ overlay_text_color=’#ffffff’ animation=’pop-up’ admin_preview_bg=”][/av_image] [/av_two_third][/av_section][av_section min_height=” min_height_px=’500px’ padding=’small’ shadow=’no-border-styling’ bottom_border=’no-border-styling’ id=” color=’main_color’ custom_bg=” src=’https://www.innovationgeneration.com.au/wordpress/wp-content/uploads/2014/07/BKGRND1a.jpg’ attachment=’460′ attachment_size=’full’ attach=’parallax’ position=’top center’ repeat=’no-repeat’ video=” video_ratio=’16:9′] [av_one_fifth first] [av_image src=’https://www.innovationgeneration.com.au/wordpress/wp-content/uploads/2016/04/Liz-Stott-family-pic-300×200.jpg’ attachment=’1950′ attachment_size=’medium’ align=’right’ styling=” hover=” link=” target=” caption=” font_size=” appearance=” overlay_opacity=’0.4′ overlay_color=’#000000′ overlay_text_color=’#ffffff’ animation=’no-animation’ admin_preview_bg=”][/av_image] [/av_one_fifth][av_one_half min_height=” vertical_alignment=” space=” custom_margin=” margin=’0px’ padding=’0px’ border=” border_color=” radius=’0px’ background_color=” src=” background_position=’top left’ background_repeat=’no-repeat’ animation=” mobile_display=”] [av_heading heading=’Liz Stott’ tag=’h1′ style=’blockquote modern-quote’ size=” subheading_active=’subheading_below’ subheading_size=’15’ padding=’10’ color=” custom_font=” admin_preview_bg=”][/av_heading] [av_textblock size=” font_color=” color=” admin_preview_bg=”] Liz Stott is one part of a family partnership alongside her husband, Dallas, and his parents, Peter and Lorraine farming in the Murrumbidgee Irrigation Area near Leeton. The Stott family have been farming in the region for over 60 years growing irrigated corn, rice, wheat, barley and cotton. Liz moved to the area nearly 10 years ago, having grown up in Canberra, and has thrown herself into the family farming business whilst also establishing her own career in communications and water policy. 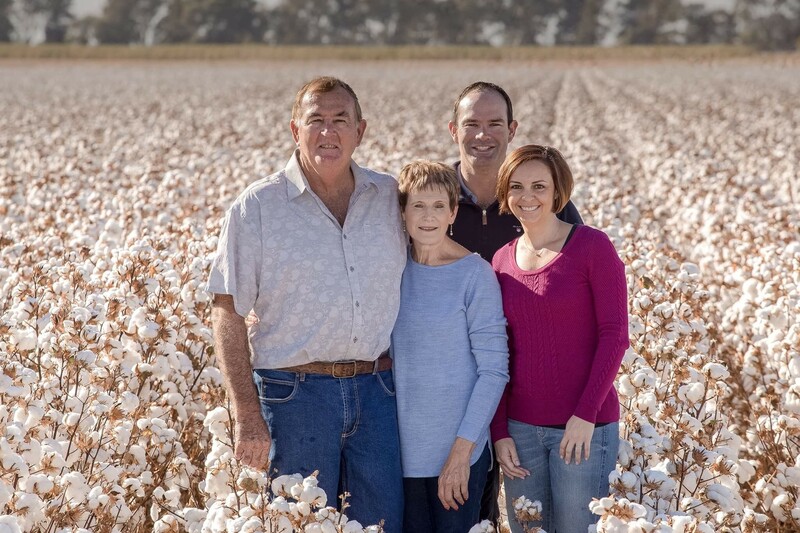 Over the past 9 years, their farming business has expanded significantly with a focus now on cotton production, water efficient layouts and irrigation automation. The ongoing success of the family business relies on trust, partnerships, communication and innovation and Liz hopes to share some of their experiences which may be valuable to attendees in similar farming arrangements.